Earlier this summer in a packed and freezing-cold auditorium in Doha, the all-female team of students from Qatar University burst into cheers and tears as they were pronounced winners of the country’s INJAZ Young Enterprise of the Year Competition. As the crowd gave them a standing ovation, tiny LED lights flashed and faint vibrations could be seen and felt on the wrists of a few people in the audience – the reason for the team’s success. In just a few months, the young entrepreneurs designed, prototyped and even sold their idea called VibroHear – a sleek, colourful, and elegantly designed bracelet meant to give “a sense of security” and the “feeling” of sound to those with hearing disabilities. “We have designed this bracelet specially to help people with hearing disabilities get independent, and enjoy life with the luxury that others do,” says Haya Al Nuaimi, the company’s executive president. The VibroHear bracelet is a remarkably simple device. It vibrates and flashes green or red LED lights, the intensity and colour of which depend on the volume and closeness of sound. The hope is that this little bracelet will help alert deaf people to potential dangers – for example, a fire alarm or a honking car- while also enabling them to “feel” sound. To do so, however, it will have to overcome some substantial barriers that have thwarted other efforts in the past. Deafness is ultimately an invisible disability – you can't see it in the way that you can see someone who has lost an arm or a leg, making it what some call the “most normal” disability possible. Yet that doesn’t make life any easier for those affected. “The major barrier [for deaf people] is trying to communicate like everyone else does, especially when dealing with strangers, or people who don’t know how to deal with individuals with hearing loss,” says Thomas Fiddian, a technology specialist for UK-based charity Action on Hearing Loss, and former industrial designer. Because of this communication difficulty, Fiddian says, deaf people tend to rely more on technologies (like subtitles, captioning and hearing aids) on a day-to-day basis more than people with other disabilities. While these tools are essential for regular communication and interactions, some technologies have tried going a step further, promising to help deaf people “feel” or “see” sound in different ways, either for pleasure or for security – such as the service VibroHear offers. For example, in 2010 German designer Frederik Podzuweit came up with a collar concept called the “Music For Deaf People”, which converts sound input into vibrations which supposedly stimulate the exact sound-processing regions of the brain associated with full hearing. Instead of hearing sound, wearers can in effect “feel” it through their skin. Just last year, a team of researchers from the Korea Advanced Institute of Science and Technology (KAIST) in South Korea, designed a pair of glasses that can help deaf people “see sound”, and, potentially, life-saving cues. The glasses have seven tiny microphones fixed to the frame, which detect the location of a sound, regular or dangerous, and relay the information to the wearer through specially positioned LED lights inside the glasses. While the current prototype requires the user to carry a small laptop to process the signals, the team hopes to miniaturise the system soon to make it more practical. Also in South Korea, designers Kwang-seok Jeong, Min-hee Kim and Hyun-joong Kim have created Vibering – a watch coupled with two rings (one to be worn on each hand) that vibrate according to the distance and position of the sound. It was originally conceived for people who listen to music with earphones in the street very loudly, admits lead designer Kwang-seok Jeong, before they realised it could help alert deaf people to sounds coming from behind them – presenting the information on an easy-to-read display. All of these may seem like great ideas, yet most are still only concepts or prototypes – which begs the question: why have so few innovations for deaf people actually made it to market? “There are many terrific concepts that exist, but the cost of going through R&D and actually bringing a product to market is more expensive than the return that a specialised product can offer,” says Anthony Mowl, National Marketing Director for Communication Service for the Deaf, (CSD), a US-based organisation that innovates products and services for the Deaf and hard of hearing. The biggest obstacle to developing niche technologies for deaf people, he says, is simply a case of supply and demand. According to the World Health Organization, just over 5% of the world’s population – around 360 million people – suffer from disabling hearing loss, but the majority of these people live in low- and middle-income countries. As a consequence, most “assistive” devices like hearing aids end up being prohibitively expensive. The average retail price for a hearing aid ranges from $3,000 to $6,000. That’s no small change, especially for a community that often faces far fewer employment prospects than the general population. While accurate numbers are hard to find, in the US and UK unemployment or underemployment rates for deaf people is at least double, if not far greater, than the general population. The answer to cheaper innovations may actually be resting in our pockets. Instead of investing in costly assistive products, companies are now starting to adapt everyday devices we carry around into tools to help deaf and hard-of-hearing people, says Fiddian. Mowl’s organisation, CSD, is one of many trying to tap into existing devices. They offer Video Remote Interpreting (VRI) for instance, through the use of tablets and computers, and are working on currently launching something called Vineya – a network of interpreters that can be scheduled and billed on-demand outside through this service. Simpler services, such as iPhone apps like ClearCaptions (which is free for those with hearing loss, according to the company), adds instant captions to phone calls made on an iPhone, iPad, or iPod Touch. 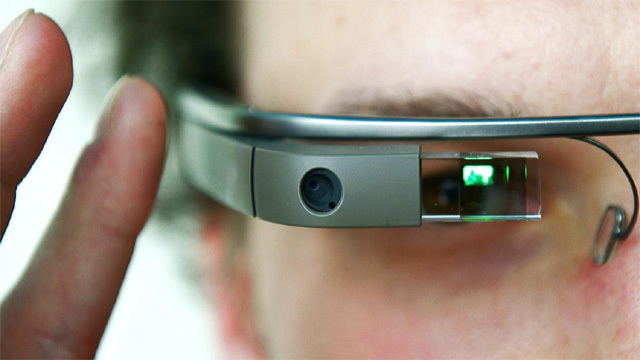 But the most promising innovation may soon be on the horizon: Google Glass. The camera and display built into spectacle frames, which projects a colour-image display with a live stream of information may only be in the hands of early adopters now. But if this was coupled with Google’s existing real-time speech recognition and captioning software used on YouTube, for instance, Google Glass could actually enable live subtitling of real-time conversations, allowing deaf people to have a near fluid conversation while maintaining eye contact. The impact of such instant, wearable technology would be enormous for the deaf community, says Mowl. Yet, the reason Google has been able to invest so heavily in a service that could benefit the deaf community, Mowl claims, is primarily because their captioning software has made videos searchable, which drives advertising revenue. Regardless, the more technology seeps into our everyday lives and interactions, the more seamless it is becoming for the deaf community to interact and live normal lives. While assistive technologies for the deaf will always be needed, it’s likely the inclusive ones will break down the biggest barriers, and more importantly, at the most accessible prices. On the relatively simpler end of the wearable technology spectrum, the team behind VibroHear says it plans to sell its bracelets for 500 Qatari Riyals, or around $137 each. That would make it one of the cheapest assistive innovations for deaf people on the market. Time will tell if this little bracelet can succeed where others have so far failed. Written by Jonathan Kalan. Originally appeared on BBC.